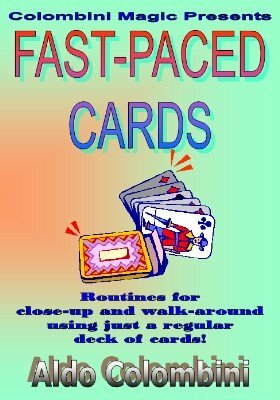 This download DVD contains an amazing collection of routines for close-up and walk-around using just a regular deck of cards and with minimal sleight of hand (some of them are self-working). ACES-ANDWICH (Aldo Colombini): The Aces find three selected cards! SIMPLE AND FAST (Aldo Colombini): The spectator cuts the deck and finds the four Kings! THREE-SIDED CARD DISCOVERY (Ken de Courcy): After showing that a card has three sides (!) you reveal a selection! CARD-IOSITIES (Reinhard Müller): Four cards are freely selected and they are seen to be the only different colored cards in four packets! SECURITY EXPRESS (Milton Kort): Four Aces disappear between two Jacks and reappear between two other Jacks! ACE-CUT SELECTION (Paul Gordon): Two Aces find a selected card and also the other two Aces! MAGNETIC FORCE (Karl Fulves): Two cards, with the help of a spectator, find their mates! IN THE OUTBACK (Aldo Colombini): You reveal a selected card with a beautiful flourish! KON-KING POKER (Didier Dupré): A classic revisited. A jumbo prediction seems wrong and then everything is put right with a Royal Flush revelation! VORTEX (Aldo Colombini): Two Jacks find a selected card, which disappears between them and reappears reversed in the middle of the deck!